While you may think of a rainforest as being perpetually wet and rainy, the world’s largest rainforest, the Amazon, actually has a dry season when the clouds clear and sunlight drenches the trees. It is during this period, the time without rain, that the forest grows the most. For much of the Amazon Rainforest, the dry season occurs in June, July, and August. During this period, the thick blanket of clouds brought in by large-scale patterns in the atmosphere disappear, and smaller-scale processes that influence the weather become apparent. 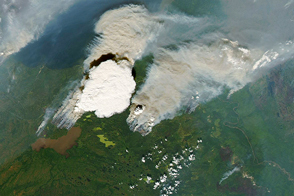 This image, captured by the Moderate Resolution Imaging Spectroradiometer (MODIS) on NASA’s Aqua satellite on August 19, 2009, reveals how the forest and the atmosphere interacted to create a uniform layer of “popcorn” clouds one afternoon. The clouds likely formed from water vapor released from trees and other plants throughout the day. Plants convert light, carbon dioxide, and water into sugar and oxygen through photosynthesis. As the plants inhale carbon dioxide, water vapor escapes, a process called transpiration. During the dry season, the rainforest gets more sunlight. The plants thrive, putting out extra leaves and increasing photosynthesis. The photosynthesizing plants release water vapour into the atmosphere. In the heat of the day, the air rises and eventually condenses into clouds like the popcorn clouds shown in this image. The clouds are distributed evenly across the forest, but no clouds formed over the rivers. In general, land warms more quickly than water and gives off more heat during the day. The hot air from the land rises, carrying water vapor from both evaporation and transpiration with it. The air cools as it rises, and the water vapor condenses into the tiny clouds seen here. But what goes up must come down. In this case, the air mass descends over the rivers, when temperatures are cooler. As the air drops, it warms, and the warming air keeps the water vapor from condensing into clouds. As a result, there are no clouds over the rivers. When water vapor condenses, it releases heat into the atmosphere. The heating causes the air to rise even more. The higher it rises, the more the air expands and cools, which allows more water vapor to condense. Eventually, thunderstorms can form. The more concentrated clusters of clouds in the image are likely thunderstorms. In the Amazon, transpiration may play a significant role in transitioning between the rainy and the dry seasons. Westward-blowing trade winds carry moisture from the Atlantic Ocean over South America year round. 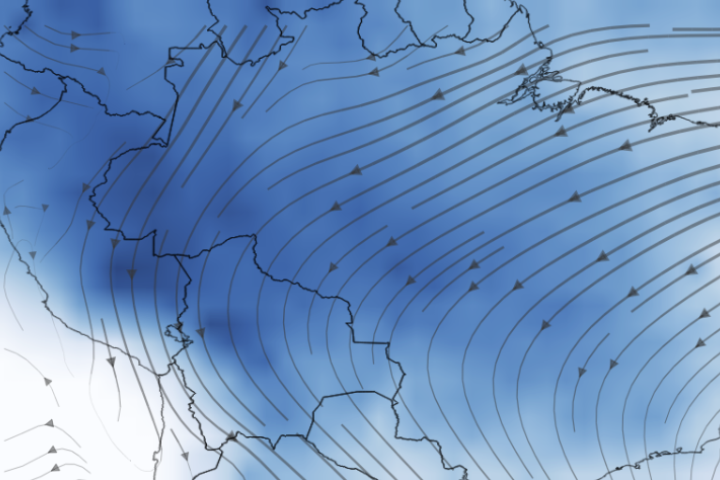 Once over the continent, regional winds channel the moist air north or south. When winds blow north, Atlantic moisture goes with it, and the part of the rainforest south of the equator experiences a dry season. When winds shift to the south, the seasons reverse. 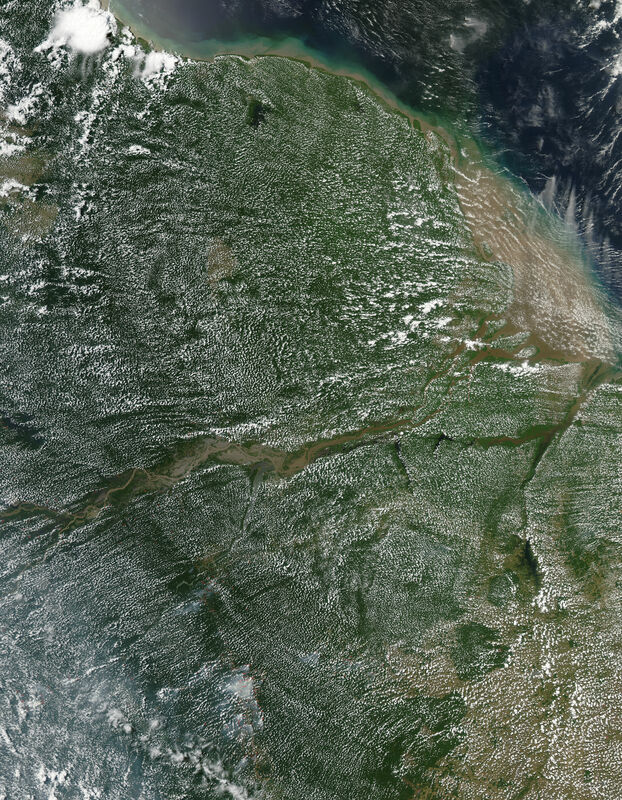 Tropical climatologist Rong Fu, of Georgia Institute of Technology, believes that the shift in wind direction toward the southern Amazon may be triggered by late dry-season thunderstorms originating from transpiring plants. The widespread thunderstorms carry heat high into the atmosphere. The heated air rises, and air from the north replaces it. This movement of air creates the winds that channel monsoon moisture back to the southern part of the Amazon Rainforest. To read more about the connection between the rainforest and the atmosphere, see The Amazon’s Seasonal Secret on the Earth Observatory. NASA image courtesy Jeff Schmaltz, MODIS Rapid Response at NASA GSFC. Caption by Holli Riebeek. 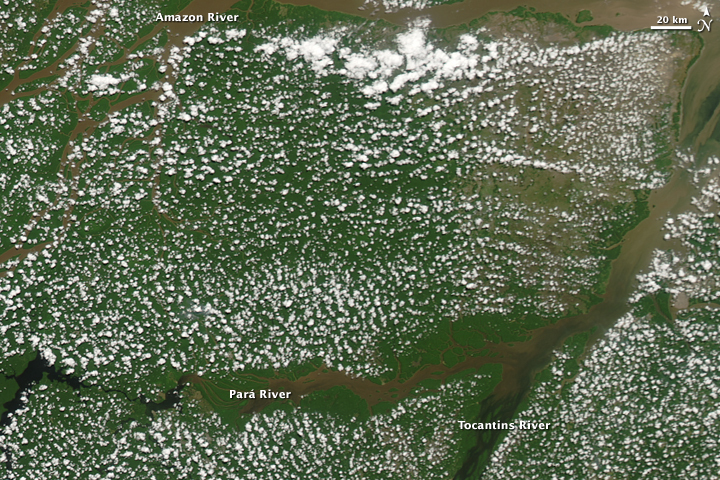 A uniform layer of tiny “popcorn” clouds covers the Amazon Rainforest in this image from August 19, 2009. The clouds are a byproduct of photosynthesis. Farabee, M.J. (2007, June 6). Phot osynthesis. On-line Biology Book, Estrella Mountain Community College. Accessed August 21, 2009. Graham, S., Parkinson, C., Chahine, M. The Water Cycle. 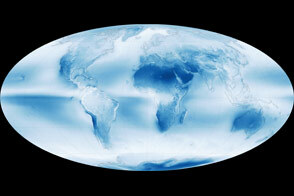 NASA’s Earth Observatory. Accessed August 21, 2009. Lindsey, R. (2007, May 22). The Amazon’s Seasonal Secret. NASA’s Earth Observatory. Accessed August 21, 2009. U.S. Geological Survey. (2009, May 13). The Water Cycle: Transpiration. Accessed August 21, 2009.